The following is a preview of the Demonstrating Value Workbook. For the complete Workbook, please download the workbook, worksheet and appendix files located on the left hand side. The Workbook is also available in Chinese, courtesy of the Workforce Development Agency, Ministry of Labor, Taiwan. Demonstrating Value can help you take control of the data you collect, how it is used and to communicate the performance and value of your organization, social enterprise or program. In this activity guide, you will work out what your data needs are, how they can be met, and how to design a ‘Snapshot’ that will provide an engaging summary of the performance and value of your organization. The remainder of this activity book will guide you through these steps. The purpose of each step is first described, followed by specific activities for you to do in the Activity Worksheets that accompanies this guide. This is available on the downloadable file section to the left of this page. We recommend working through this workbook with a cross-section of people in the organization. You can do this in a workshop, a series of meetings or through targeted consultations. In essence, you need to think about the story you want to tell and the decisions that can be better supported by data. Determining what information is useful is a big task, but it can be simplified by looking at what you do from three different perspectives. 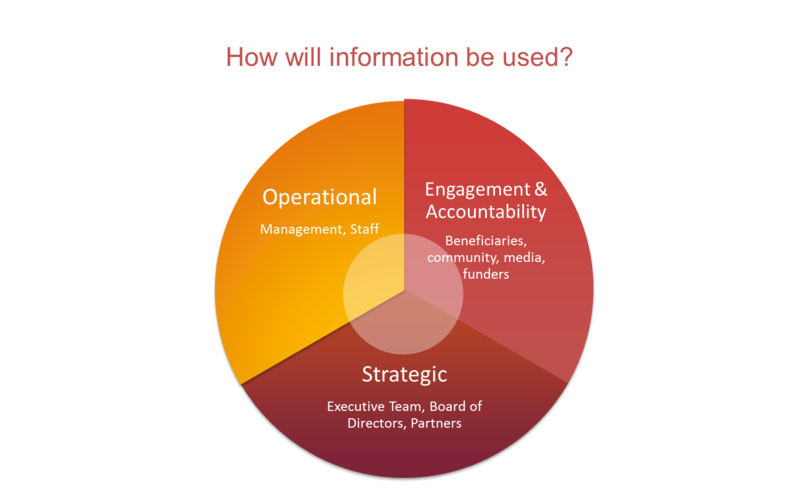 An Organizational Sustainability Perspective - What information can help you understand whether you are developing and maintaining resources to meet your purpose in the long run? 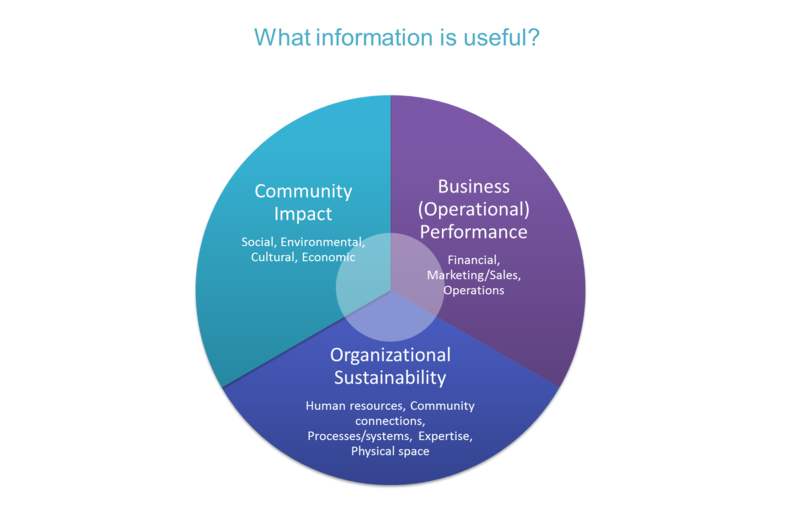 A Community Impact Perspective - What information can tell you about the ability of the organization to successfully contribute towards the social, cultural and environmental objectives set out in its mission? A Business Performance Perspective - What information can tell you about the success of the organization from a financial or ‘business’ perspective? An Operational Perspective - What information do you need to support day-to-day decisions by management and staff? For instance, what can help you stay on top of costs, quality, and delivery of your mission? A Strategic Perspective - What information do you need to support strategic decisions that are often made by a governance body such as a board? This information needs to educate your audience about key trends and events that have occurred. An Engagement & Accountability Perspective - What information do you need to foster and maintain support of the organization? This includes support by investors, community members, employees and beneficiaries of your mission. This audience may have very limited knowledge of who you are and what you are trying to accomplish so your "story" needs to be very crisp. ACTIVITY 1: Use Worksheet 1 to identify your stakeholders and describe what information they need to do their job effectively. Then assess how you can better engage them. A Snapshot is a communication tool that you can use to present the performance and value of your organization, program or project to boards, investors/funders and staff. It is tailored to your needs and the audiences you want to connect with, and can take the form of an Infographic, Dashboard or Impact Report. Saving valuable time finding and pulling together data and other information for reports. Seeing key trends and relationships in data, so you can get the most from the data you collect. Combining different types of information effectively to engage your audience. The exact content and format of the Snapshot depends on who you want to reach and the issues that are important. For example, the layout and content for a bi-monthly board presentation might be very different from a Snapshot designed to be part of your public website to engage volunteers and donors. The design process includes thinking about who the audience is, what decisions they are making, the messages you want to convey, and the information you will present (which can include numeric, narrative, pictures and other types of information). Snapshots vary in terms of the visual elements that they include and how they balance text and numerical information. Typical forms are Dashboards, Infographics and Impact Reports. Any of these can be presented as a printed/PDF document or can be web-based. A Dashboard displays indicators (also termed measures, metrics and data points) for an organization, department, team or process. It is typically an internal tool that is directed to management, a senior executive team or an advisory/governance board. Indicators are organized around objectives and include key performance indicators (‘results’) and key success factors (‘what drives the results’). An Infographic is a representation of information that is graphically designed to make data easily understandable at a glance. It is mainly used as a communication tool to external audiences, often as a small poster that can be displayed. The information is presented in a fun and eye-catching way. An Impact Report may be a section of an annual report or a stand-alone report that clearly communicates your mission and impact. The length can range from a few pages to more than a dozen; you can go into more detail about your impact than in an Infographic. The information is still presented in an eye-catching way with a balance of photographs, figures, metrics and text. A Snapshot can be designed with different tools depending on your budget and needs. Once you design a Snapshot, you can easily create versions of it to suit other audiences. For instance, a Snapshot that is developed for an Advisory Board could later be adjusted to serve as a public Snapshot, but changed to include less detailed data more suitable to a public facing document. You can use a professional graphic designer to create a Snapshot or design it yourself. There are many software programs out there that feature intuitive, drag-and-drop design features, including office programs that you may already use, graphic design programs and interactive data visualization / business intelligence solutions. These are described in more detail below. You can start by designing something that is fairly basic and move to a more sophisticated design later on. Like any effective communications tool, the substance of what you present is the most important, and it may take a few iterations to develop a succinct and effective way to convey what you do, and why it is important. While there are some excellent design features in these programs, if you are not fully familiar with them, they can be a little frustrating to use. Web tutorials are a good place to learn. This guide also provides some tips. The file size can get quite large. Sometimes this affects the performance of the program. It’s a good idea to close anything else that you may be working on. It is very easy to copy and paste parts of the Snapshot into other documents, presentations and e-mails. The image quality will not be as sharp as other options, but they are still pretty good, especially if any photos that you include are high resolution. You can save them as PDF or as graphic files such as JPG and PNG. These programs enable you to produce very high quality graphics. The drag-and-drop options have many infographic and report templates that provide and excellent starting point. In terms of the cost, many drag-and-drop solutions offer a ‘freemium’ payment model which enables you do some basic creation for free, with a paid subscription for more frills. Check for discounts for non-profits. The drag-and-drop programs and the companies associated with them are new and the landscape is changing. Using a smaller vendor can carry some risk that they will not stay in business. Many solutions are cloud-based and licensed monthly or annually. Some are targetted to corporate clients, and as such, are pricey. Others are directed at smaller-scale users. Many companies offer significant discounts to non-profits organizations for basic versions of their product. A great place to check for discounts is with TechSoup which connects charitable non-profits with donated and discounted technologies. A user can ‘slice and dice’ data, and test different assumption by manipulating input parameters. This is useful when you have large datasets. Visualizing the data helps users gain insights that they might not gain in other ways. Data connections can often be established in ‘real-time’, a helpful feature if you need to see updates frequently. The learning curve can be significant, but a user comfortable with databases or more advanced features in spreadsheets can adapt to these programs easily. No programming is required and design is simplified with a drag-and-drop interface. Many companies that offer these programs are start-ups and the landscape is changing. Using a smaller vendor can carry some risk that they will not stay in business. ACTIVITY 2: Create a Vision of Your Snapshot. What kind of Snapshot would you like to develop? To get ideas, look at Snapshot template designs and examples as a starting point. You can see a number of snapshot templates and examples on the DV website: www.demonstratingvalue.org/snapshots There are also many templates and examples available on the websites associated with the drag-and-drop software solutions described above, such as Piktochart, Easelly and Tableau. You may also want to explore Dashboards, Infographic and Impact Reports on-line in your field through an internet search. Once you have researched Snapshot Designs, fill in Worksheet 2. We have been successful in increasing community participation in recycling. Testimonials from those who never recycled before, but who are now recycling because of the program. Information can be numerical (quantitative indicators, measures and metrics). It can also be excerpts from research, testimonials, narrative, images, short diagrams and other forms of information that can be useful in supporting what you want to know and show. At this point, you don’t need to identify the best information / indicators, just brainstorm ways that you can show this. Include both what you currently collect and what you could in the future. You will have opportunity to refine this later. https://sdgcompass.org (look for Business Indicators; The Tool Search is also very useful). ACTIVITY 3: Use Worksheet 3 to define the information that could be included in your Snapshot based on your organization's vision, mission and objectives. In the previous step, you identified the information that is important for you to collect and potentially show in a snapshot. You also identified a preliminary design in Step 2. You will now put the two together in a draft snapshot by first refining the design and then combining the design with content. ACTIVITY 4: Develop your Snapshot design more fully. Look at the Snapshot designs that you identified in Worksheet 2 (d). Using one of the design tools described in the earlier section on Design Tools, design a draft snapshot that reflects the branding and desired look. There is no need to include content yet. Focus on the visual design only. The Demonstrating Value website includes a number of different templates at www.demonstratingvalue.org/snapshots. Click on the name of the template to find the downloadable files that include both the template (DOCX) and instructions (in PDF with yellow callout boxes contain suggestions for how to personalize the template in Microsoft Word). While the templates are designed in Microsoft Word, these can also be edited in Google Docs quite easily. Click on any part of the image to edit in Google Docs’ drawing tool. The following tips may help you to refine a design for your Snapshot that is visually effective, and which will capture and hold the attention of others. 1. Keep it simple and uncluttered. 2. Limit your colour choices. Use colours that ‘go together’ (colour harmony). Pick colour scheme based on your logo, or a key photo in the snapshot. There is more about is below. 3. Limit the number of fonts to 2. Use contrasting fonts and stay away from frilly fonts. Generally use serif for body, non-serif for heading. 4. Use white space effectively. 5. Use simple short text and keep it away from the edges. 6. Use an invisible grid (align sections and elements in the design). 7. Use borders, shadows, contrast and complementary colours to draw special attention to something. There are many great resources to learn more about design (like the Visual Learning Centre https://blog.visme.co/). If you budget permits, you can turn to professional support to produce something polished. It is really hard to match colours with your eye. It is better to find the code (usually HEX or RGB). If you don’t know it, you can use a web program. For instance, you can upload an image to www.colorcodepicker.com and use the curser to move over your image to reveal the colour codes. Once you have identified your colour(s) you can set them up in your design program of choice. HEX codes can be converted to RGB codes, and vis versa using web tools like www.rgbtohex.net. If you want to identify additional colours in your Snapshot, you can find many ideas on-line, for instance at: www.colorbook.io and www.color-hex.com, which show various colour palettes and schemes and which can show you what colours work well with a colour that you already have. If you think that you may print the Snapshot out in black and white, print drafts to see how they look. Sections that stand out in colour may not standout in black or white. Adjust one of the colour’s tint or shade to fix this. Most people are familiar with this Microsoft Word, but may be less familiar with its graphic design features which are quite robust. The availability of Microsoft Word makes it an easy first step for designing snapshots. All design features are available across the Microsoft Suite of Programs, such as PowerPoint and Excel. 1. Use Text Boxes with a ‘Wrap Setting’ that is ‘In Front of the Text.’ This makes it much easier to move around and print. To do anything to a text box, including editing text, you have to select it first with a mouse. When you do this, lines appear with square boxes at the corners and half way points. 2. Set any other content that you add such as images and figures to ‘In Front of Text’ as well. This makes it so you can easily move components of the Snapshot around on the page. 3. Generally stay away from the ‘Smart Art’ feature. It makes the file size quite large and can be challenging to manipulate. It is usually easier just to draw figures directly. 4. You can easily change the shapes of objects by using the ‘Change Shape’ feature under the Format tab in the Drawing Tools Ribbon that appears when you select the shape. 5. You can easily change the look of all of the content using the ‘Design’ tab on the Ribbon. You can do this by selecting the Themes, Colour on the Design Tab. Colors, Themes and Fonts are all customizable so that you can match your organization’s branding. Using these features, it was possible to change the look of the Simple Impact Report template in less than 1 minute. Further refinements can then be made to font and colour choices. 6. Publish by saving as a PDF or creating an Image File. Saving or printing as a PDF is possible in Word. While there is not easy way to save your file as an image within Word, you can use the Snipping Tool to select all or part of your Snapshot. This is a desktop App on Windows. You can also use ‘Print Screen (PrtScr)’ on you keyboard and then open and paste it into Paint, another desktop app. You can then crop and save the image into the image file type that you prefer. All snapshots can be divided into a number of different sections - a grouping of visual content that supports a point that you want to demonstrate about your value. In the case of a dashboard, this would be indicators that provide insight about and organizational objective. A simple infographic will have only a few sections, while an impact report will have many. Content could be developed directly or planned out in advance. Download the workbook for more instruction on this topic. Decisions that the snapshot’s audience will be making. 1. Grabs the reader's attention. 2. Accurately shows the facts. 3. Complements or demonstrates arguments. 4. Has a title, labels and units. 5. Is simple and uncluttered. 6. Clearly shows any trends or differences in the data. ACTIVITY 5: Develop the content in the sections of your Snapshot. You can do this directly in the Snapshot, or you can plan the content out in advance using Worksheet 4. What is of most benefit to gather in the future? Consider this from the perspective of all stakeholders who defined the information. Are there things that are logical to do first? Are there things that would be nice to have, but are not critical? How much effort will it take to develop this data? Do you have a mechanism already in place, or can you develop one easily? What are the time and skills required collect, manage, and analyze the information? Will gathering these data be seen as intrusive by participants? Are there language or literacy challenges? Are you trained in the method, or will you need help from an outside consultant? ACTIVITY 6: Use Worksheet 5 to plan out how you can develop additional data and other content that will strengthen your Snapshot. What is of most benefit to gather? Consider this from the perspective of all stakeholders who defined the information. Are there things that are logical to do first? Are there things that would be nice to have, but are not critical? Activity Log: Staff report of daily activities. Anecdotal records: Stories and narratives about an event, an experience, or an individual, described by staff or participants. Documentation: Administrative records of activities (e.g., inventory software, reports, minutes of meetings etc.). Evaluation Form: A set of questions that determine the participants’ opinions, attitudes, and understanding once an activity is complete. Focus Group: Group discussions with a relatively small number of selected people about certain questions. Interview: A set of questions (could be predetermined or not) about certain topics that are posed to a target audience and followed by additional questions and conversations. Journal Recording: Self report of daily activities by participants. Knowledge/ Skill Tests: A set of predetermined questions about certain topics that are answered by a target audience. Survey: A set of questions that determine the level of knowledge or skills in participants. On-site visits: A combination of observation and interviews that occur in the participant’s environment. Observation notes: Notes taken through direct observation of verbal and nonverbal behaviours that occur in activities. Conducting Project Evaluation. Toronto, Ontario: Imagine Canada, 2006.